Today, management looks to marketers for innovation to increase profits and gain competitive edge. 10% of marketers say they are expanding marketing’s role to create digitally led business models as spending and expectations grow for CMOs and their teams. 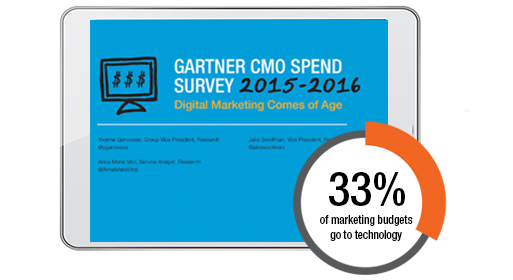 The Gartner 2015 – 16 CMO Spend Survey shows how marketers are rising to the challenge of business in a digital world. Increased spending and greater focus on digital commerce, social media and analytics are a few areas we explore as marketers take more responsibility for digital success. Gartner for Marketing Leaders connects you with experts who will advise you in the digital marketing areas that matter most — so you can plan, manage and execute a successful digital strategy. To speak with a digital marketing advisor, contact us at 1.866.592.5144 or gml@gartner.com. © 2016 Gartner, Inc. and/or its affiliates. All rights reserved. Gartner is a registered trademark of Gartner, Inc. or its affiliates. For more information, visit gartner.com/digitalmarketing.